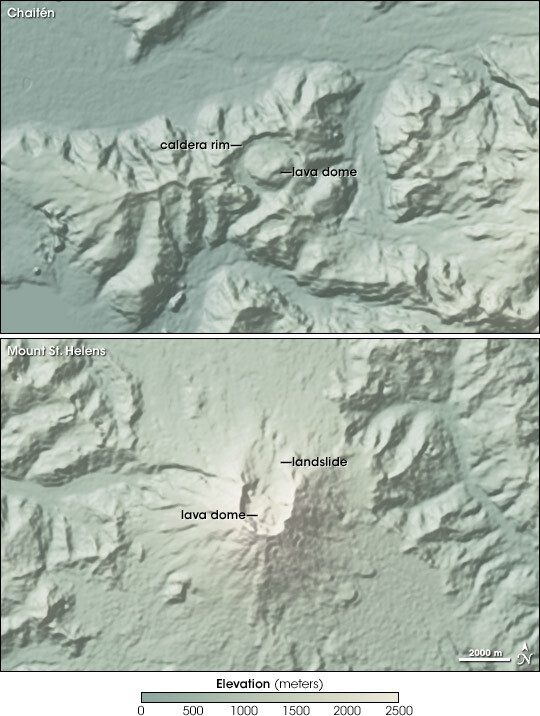 Despite being in geologically similar settings, Chaitén Volcano and Mount St. Helens have very different shapes. Both volcanoes are fueled by the thick lavas that are common in subduction zones, where one piece of Earth’s crust (a tectonic plate,) overrides another. Thick lavas make volcanoes prone to explosive eruptions, and the nature of the eruption determines the volcano’s shape. This pair of images shows the topography that results from two different types of explosive eruptions. The images are based on elevation data collected by the by the Advanced Spaceborne Emission and Reflective Radiometer (ASTER) on NASA’s Terra satellite. Green represents low elevations, while beige indicates elevations 2,500 meters (8,200 feet) and above. Chaitén is a wide, low, and circular caldera. In contrast, Mount St. Helens is a truncated cone topped with a horseshoe-shaped crater. Calderas like Chaitén’s form when a volcano erupts catastrophically, ejecting rock, ash, and lava into the air, and emptying the magma chamber below. The remaining bulk of the volcano then collapses into the resulting void, forming a crater. On Mount St. Helens, however, pressure from rising magma forced the north side of the volcano to bulge and triggered a flank eruption on May 18, 1980. The flank soon collapsed, resulting in a sideways explosion and a massive landslide that extended 27 kilometers (17 miles) to the north. 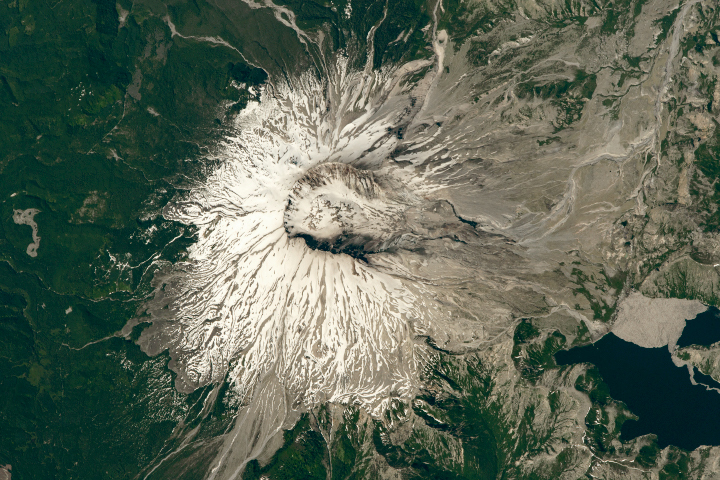 St. Helens’ summit was reduced from 2,949 meters (9,677 feet) to 2,549 meters (8,363 feet). Prior to the eruption that began in early May 2008, Chaitén’s last eruption was more than 9,000 years ago. Since then, thick magma continued to well up underneath the volcano, oozing into the center of the caldera like toothpaste squeezed from a tube. As it reached the surface, the lava solidified into a dome, which now reaches above the caldera rim. The elevation data for this image were collected on April 1, 2006, before the current eruption began. As at Chaitén, a lava dome grew in the crater of Mt. St. Helens after the principal eruption. The data pictured were acquired on May 31, 2007, towards the tail end of the most recent episode of dome building, which began in 2004. Lava from subduction zones is generally thick and viscous. Volcanoes along subduction zones are typically steep and conical (like Mount Fuji), or dome-shaped (like Mount Lassen, in California.) This lava often solidifies as it nears the surface during the course of an eruption, blocking fresh magma. In these cases, pressure in the volcano’s plumbing builds up over time. Pressure can be relieved through volcanic vents that spew gas, ash, and chunks of rock into the air; quiet dome growth; or an explosive eruption. NASA images and caption by Robert Simmon, based on data from the NASA/GSFC/METI/ERSDAC/JAROS, and U.S./Japan ASTER Science Team. Dormant for more than 9,000 years, the Chaiten Volcano in southern Chile began to erupt on May 2, 2008, forcing thousands of residents from their homes. In the months that followed, the volcano remained active.